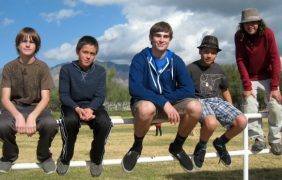 Tucson Waldorf School’s Middle School builds upon the interest and enthusiasm of the earlier years while maintaining a rigorous academic curriculum that is beautifully integrated through the arts. The core subjects are taught to inspire the intellect, awaken critical thinking and social skills, and stretch creativity while also physically challenging the capacities of the adolescent. Our excellent Middle School curriculum enhances students reasoning capacities in their important developmental transition – the milestone of becoming critical thinkers with acute skills in logic, dialogue and the important skill of synthesizing information from multiple sources to draw reasoned conclusions. 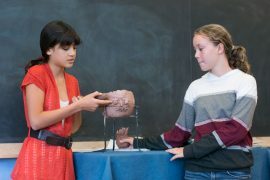 In the Middle School, students engage in the scientific process of observation, the logical reasoning of conceptual mathematics, and the study of systems of governance across the ages. They learn the physical laws of the universe and study the changes of cultural development in various historical eras. Throughout their studies, our students engage in the processes of observing and gathering data, constructing theories, debating complex issues and drawing conclusions based on well-founded reasoning. Middle School students are active social beings, and here their interpersonal skills are strengthened by opportunities to engage in projects with practical and “real world” applications. Sixth graders, for example, learn business models to manage their own fund-raising operation. 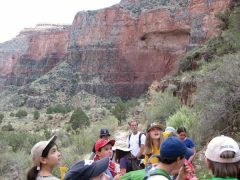 The Middle School class field trips take on a more ambitious scope that includes physical challenges (extreme ropes courses, rock climbing, hiking the Grand Canyon, caving trips, wilderness camping, etc.) and travel that test students and also allows them to build confidence in their capabilities while creating memorable bonding experiences with their classmates. 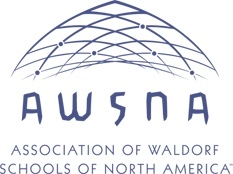 TWS graduates have distinguished themselves at many local high schools and are recognized and appreciated for their academic excellence, intellectual and creative nature, and ability to follow through and accomplish their goals.